If you are worried that you will not receive fair compensation for your losses following a Massachusetts injury accident, you may have it in your best interest to speak with an experienced personal injury attorney. Injured victims may hold negligent parties civilly liable for the damage they cause by filing a personal injury claim. During the process, the victim will have to prove liability, that an injury was suffered and that the injury was a direct result of someone else’s negligence. Retaining the services of a reputed and skilled personal injury attorney greatly increases the plaintiff’s chance for success. In Massachusetts, the percentage of compensation you may receive is connected to the degree of your responsibility for the accident. Massachusetts has adopted a modified ‘comparative negligence’ system. So, you may be able to recover damages for your injury, even if you were also negligent, as long as the defendant was ‘more negligent’ than you were (i.e., the fact finder determines that 51% or more of the blame should be attributed to the defendant). However, in such cases, the amount of your recovery will be reduced according to the percentage of culpability attributed to you. This is why it is crucial to have a skilled personal injury attorney on your side to help assess liability for the accident. 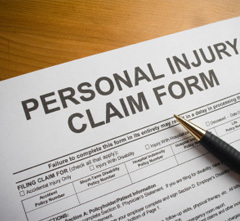 All personal injury claims have filing deadlines, which are known as statute of limitations. This means that after a specific amount of time following an accident, the injured victim will no longer be able to file a claim. In Massachusetts, the statute of limitations on personal injury claims is three years. Injured victims have it in their best interest to promptly file a claim before this time runs out and they are unable to receive any form of compensation for their injuries, damages and losses. The experienced personal injury lawyers at the Benoit Law offer legal representation to those who have been injured in Massachusetts accidents. Whatever the type of injuries you have sustained, our knowledgeable lawyers will advise you about your legal rights and options and help you secure fair and full compensation for all your injuries, damages and losses. Please call us today to schedule a free consultation and comprehensive evaluation of your Massachusetts personal injury claim.